Today we’re taking a break from our typical destination-focused Soñando Sunday in order to share about a cultural element of the Semana Santa celebrations here in Spain. First and foremost, what is Semana Santa? Penitenciales: This is a ‘penitential brotherhood,’ meaning that the group is focused on the objective of penance, the most common and public form being participation in the Semana Santa processions. The parishioners of cofradías penitenciales are responsible for the organization of much of what we associate with Easter in Spain. Sacramentales: This a ‘sacramental brotherhood,’ meaning that the group is focused on the basic objective of cultivating adoration and devotion to the sacred sacrament of the Eucharist—the “body and blood of Christ” that Catholics believe to receive in the host wafer (or traditionally, bread) and wine that is distributed during a Catholic mass. De Gloria: This is a ‘sisterhood of Glory,’ meaning that the group is not focused on any of the above objectives but instead base their association on devotion to the Virgin Mother Mary or another saint. Heavy pasos with intricate designs such as this are carried by costaleros. What do cofradías do during Semana Santa? The emblematic processions and all they entail are the work of each city or village’s cofradías penitenciales. In the weeks (and oftentimes months) leading up to Semana Santa, the local cofradías will be hard at work applying for the proper permits, contracting bands, and preparing the pasos (see image at left) for the many processions that the week will consist of. They will also carry out rehearsals of the processions as well since first-time costaleros (the men who carry said pasos) will need training for the big day. 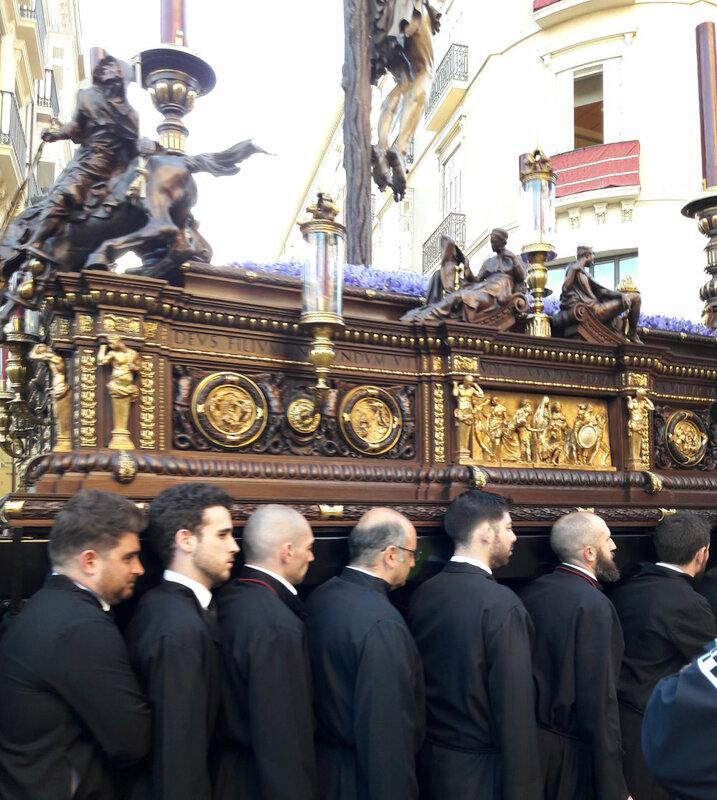 Such rehearsals may go for three or more hours to prepare the costaleros as well as possible for the penances of carrying their pasos for an entire procession (or more) in unison. It’s important to note that the cofradres (members of the brother/sisterhoods) who participate in this preparation do not consider it to be work but rather to be their obligation and promise to their community. They believe that it’s necessary to carry out these traditions in the name of Catholicism and to keep the true meaning of Easter at the forefront of this holiday. For some, devotion to their cofradías is a huge part of life. For others, it’s a seasonal activity. How do Spaniards feel about cofradías católicas? As you may already be thinking from the explanations given above, the tangible activities and purposes of cofradías throughout the year are somewhat obscure and they certainly receive some negative judgment for this reason. While membership and devotion to their association is of utmost important to the cofradres, those on the outside are often uncertain about what they actually do, creating distance and in some cases disdain between members and non-members. For those who dislike or distrust cofradías católicas, the stereotypical cofrade is the man or woman who never shuts up about the importance of penance, the sacred sacrament, and holiness. In reality, many cofrades are the average shopkeeper and bar-goer who participates in Semana Santa (among other activities) out of tradition more than religion. This, of course, leads to debate over what it truly means to be a cofrade as the most devout members of these associations participate in their activities all throughout the year while others show up simply to participate during Semana Santa. It’s hard to generalize how people feel about this, but if you’re interested and willing to get some Spanish reading practice in, check out this debate to get a better idea.